The International Journal of Screendance, Issue 2 Now Available!! 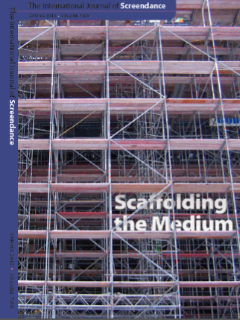 Scaffolding the Medium brings together a number of historical texts within the context of screendance as part of an endeavor to build a variable scaffolding, one that begins to both create a common knowledge base and also to support a kind of cantilevered interdisciplinarity. This issue contains five curated discussions which each take as their initial premise a key text that speaks to concerns relevant to the discourse of contemporary screendance. Iterative texts by writers including, Martin Heidegger, Amelia Jones, Laura Mulvey, Rosalind Krauss and Pia Ednie-Brown inspire reflections by Ann Cooper Albright, Ann Dils, Kent de Spain, Lisa Naugle and John Crawford, Tom Lopez, Harmony Bench, Hannah Kosstrin, Jason Farman, Melissa Blanco Borelli, Douglas Rosenberg, Virginia Piper, Terry Sprague, Rodrigo Alonso, Claudia Rosiny, Kyra Norman, Miranda Pennell, Augusto Corrieri, Simon Ellis, Dianne Reid and Lucy Cash. Artist’s pages by Adam Roberts, reviews by Scott deLahunta and Claudia Rosiny and a section on Maya Deren by Elinor Cleghorn. Finally, the issue features a report on the recent Screendance Symposium in Brighton by Claudia Kappenberg and Sarah Whatley. This issue is edited by Douglas Rosenberg and Claudia Kappenberg. What Matters follows on from the highly successful What If… festival which took place in 2010, at the Siobhan Davies Studios. Co-curated by Cash and Edmunds, together with Claudia Kappenberg, Chirstinn Whyte and Gill Clarke from Independent Dance, the festival sought to encourage an expanded perception of what might be seen as ‘dance’ work. Returning to the Siobhan Davies Studios for four days in April 2012, Cash and Edmunds will be presenting another thoughtfully curated programme of screenings, performance, debate and discussion located throughout the building, this time under the title of What Matters. This will be a unique opportunity to see a range of experimental work and choreographic enquiry across traditional art-form boundaries from the UK, Europe and further afield. Sitting somewhere between a choreographed exhibition and an exhibited choreography, the curators delve into what really matters in the context of these artists’ practices. What Matters is presented by Independent Dance in association with Siobhan Davies Dance and South East Dance. Supported by the National Lottery through Arts Council England. Additional support from the International Journal of Screendance. Produced by Artsadmin with straybird.